For fine art and photography giclee printing, we need a minimum of 120 dpi (resolution) at the size you intend to order. If your resolution is naturally higher than that, perfect! Unfortunately, we can't guarantee the print quality of any files with a native resolution lower than 120 dpi. Please do not open your file in Photoshop and increase the resolution. Although Photoshop allows you to do this, it causes undesirable results and a poor quality print. All printers print in a CMYK color space. You do not need to convert your file from RGB prior to upload, and we prefer that you don't in the final file you upload to us. However, some colors in the visual and RGB color spectrum fall outside of the gamut of what printers are capable of printing. These colors are often very pure blues, reds, and other bright colors. If you have color concerns, we highly recommend that you convert to CMYK on your end to get an idea of whether or not any colors in your image will dull or change in print. 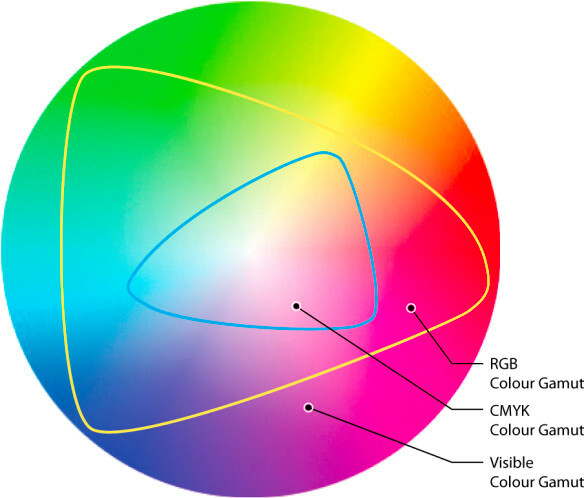 Below is a helpful color graphic that illustrates the colors available in the visible color spectrum vs. RGB and CMYK. 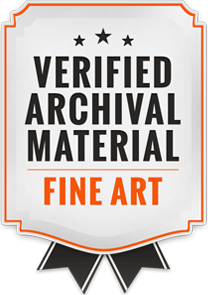 All images printed on matte, photo, or fine art paper substrates will be printed with a white border in addition to your image size unless otherwise specified. For images under 11"x14", we will print with 1/2" white border. For anything larger than 11"x14", we will print with 1" white border. If you prefer something different, such as no border (Full Bleed), please either select from our other border sizing options in the styles tab, or make a note in the message section before adding the item to your cart and we'll be happy to accommodate you. Graphic design services include color correction and any file touch up work such as removal of imperfections, dust, hair, overall image cleanup.